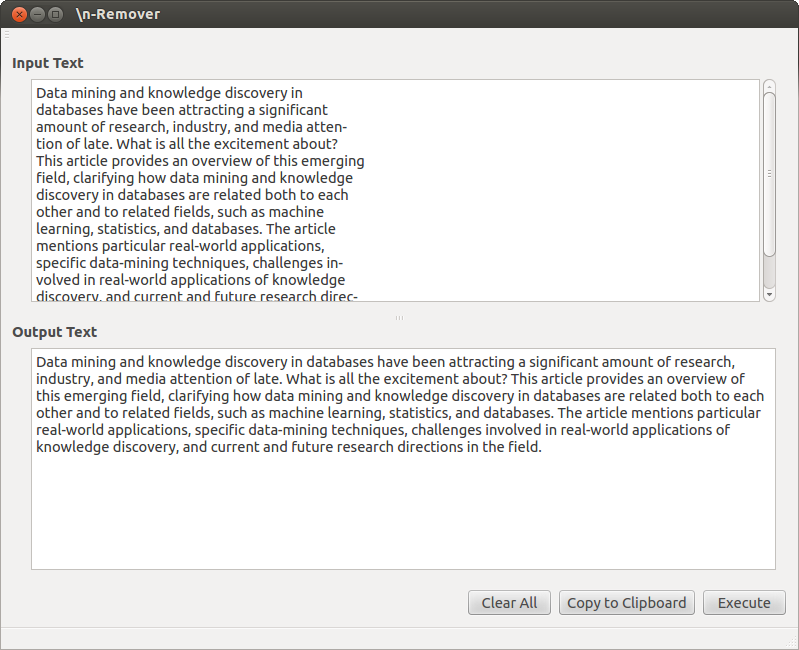 The \n-Remover is an home-made application that lets to remove the newlines from a text. Maybe this could be the most useless application ever thought but sometimes when you have it why not use it. This application has been developed because when you do copy and paste from a pdf file to a text file, you get the text with the newlines. These newlines could be very frustrating because they make a mess. This software solves this problem because takes as input any kind of text and gives in the output a formatted text without newlines. The GUI is really minimal. It is composed by two text box, the Input Text and Output Text. In the image below, there is an example that shows how a text copied from a pdf file (that comes with newlines) is formatted in the output section. At the bottom there are three buttons. The first one is Clear All that lets to clean the input texts. The second one is Copy To Clipboard, that lets to copy the output text. At the end there’s the Execute button that starts the parsing of the input text to give in output a single line text. In the menu bar there is also a options section, where it possible to set a Keep Paragraphs flag. It consists in keeping the paragraphs in the output text. As an example, consider a end of paragraph and then a newline in the pdf file, the output of the application will preserve that end of line. This application uses the abstraction of the Qt Framework to work with QString objects. However I want to thank whoever wants to use this application, give suggestions, make it bigger and better.